This entry was posted on January 6, 2014 by Van Rental. Nissan’s plans to launch a London tax model based on its NV200 van (or ‘multi-purpose platform’, to use the company’s preferred description) are no secret. The company first showcased a working model back in August 2012, but things have changed a bit since then. According to Nissan, it received feedback from the London Mayor’s office and Transport for London which sent the firm’s designers scurrying back to their drawing boards to change the way the taxi looks. Designers at Nissan’s European design centre in Paddington have drawn on styling cues from the current TX1 cab in an effort to persuade passengers and cabbies that their vehicle belongs on London’s streets. Although the NV200 taxi is also destined for use in Barcelona, New York and Tokyo, the firm will produce a London-specific version in an effort to provide the required look. “Having already overcome the unique technical challenges presented by the development of a new Hackney Carriage for London ahead of our launch of the vehicle in August 2012, we turned our attention to making the vehicle look the part. “The Mayor’s office and taxi drivers were very keen that we maintain the character of the Hackney Carriage, making it something that people in the city can be proud of. Nissan intends to put the NV200 Taxi for London on sale in the Capital in December 2014, followed by an all-electric version, the e-NV200, in 2015. From launch, the new taxi will be available with a 1.6-litre petrol engine equipped with an automatic gearbox. Compared to current diesel London taxis, this engine will be far cleaner, with lower levels of NOx and particulates. 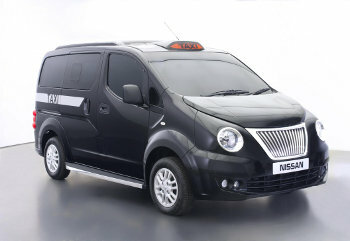 Where can I get nissan nv200 taxi hackney?